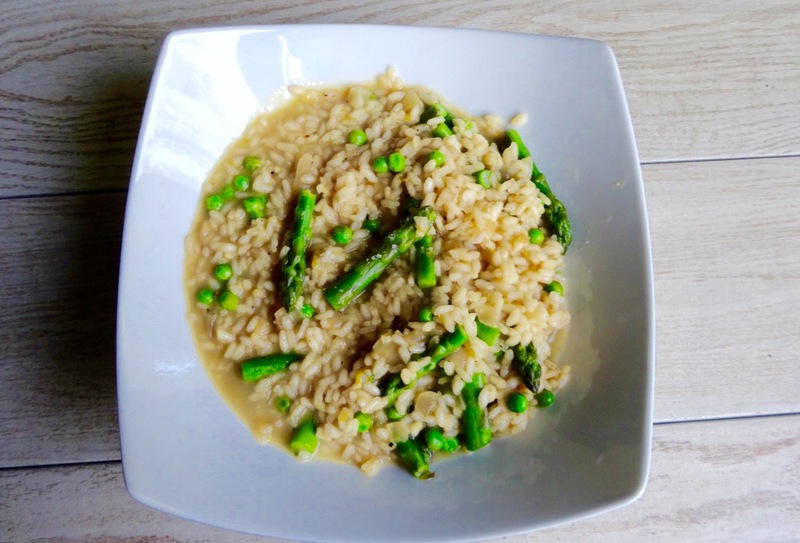 This risotto looks and tastes like it came from a restauraunt so it is sure to impress your dinner guests! The freshness of the zest and bright green from the asparagus and peas create a beautiful dish that is perfect for spring. Heat stock or broth in a pot over medium low heat. For the asparagus, in another pan, fill with 2-3 inches of salted water and bring to a simmer. Add the asparagus and cook for two minutes, until they are bright green and firm to the bite. Remove and cool slightly. Cut the asparagus spears into quarters. In a large, heavy bottomed saucepan, heat the olive oil over medium high heat. Add the onions and saute until translucent. Lower the heat to medium, and add the rice. Stir to coat and toast slightly, for two minutes. Add the wine and stir until the liquid has evaporated. Season with salt and pepper. Without pausing, gradually add ladles of the heated stock or broth to the rice and stir until all of the liquid has evaporated. Keep adding the liquid, a ladle at a time. This process should take about seventeen to twenty minutes. Before adding the last ladle of liquid, add the peas. Once all the liquid is added, add the asparagus, zest, parmesan, and adjust the seasoning to taste. To keep this dish vegetarian, feel free to use vegetable stock.